It took my wife and I about six months to find a home in the country that had enough room to build a shop and we moved into the house about the first of March in 2013. 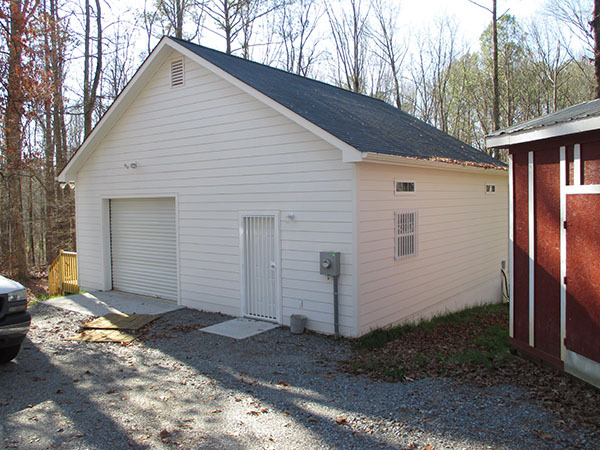 The first two pictures are just an exterior view of the shop building. It was not until the first of October that the shop was completed. The shop is 30ft × 30ft with 10 ft. ceilings. The walls are 2×6 inch studs and fully insulated with sheetrock on the interior and hardy board exterior siding. There is an attic over the ceiling and the shop has a heat pump and air conditioning. It seems to be very economical so far and I keep the shop 60 degrees in winter and 80 degrees in the summer. There is also a ventilation fan to help cool the shop in spring and fall. The electrical service is 230 V, 1 PH, and 200 A and is separate from the house service. 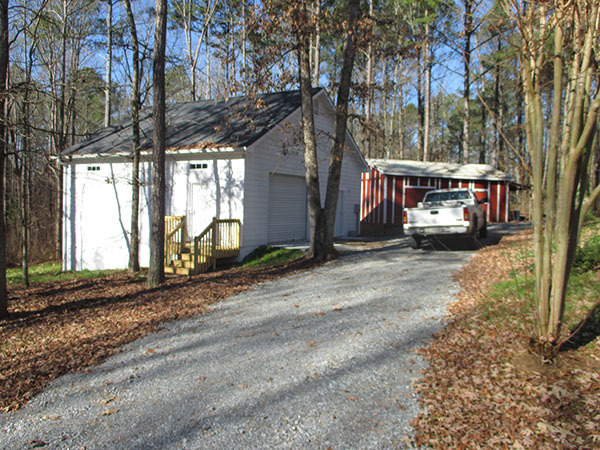 The old red shed is 15×24 and will be a convenient place to store a little lumber as well as a few other things. If I had it to do over again I would have made the shop 35×35. I’m not sure where I would have gotten the money because 30×30 was what I thought I could afford. When it comes to the subject of shop size the common answer is that no matter what size you build your shop it won’t be big enough. Building any shop is full of trade offs and the budget often trumps other decisions. 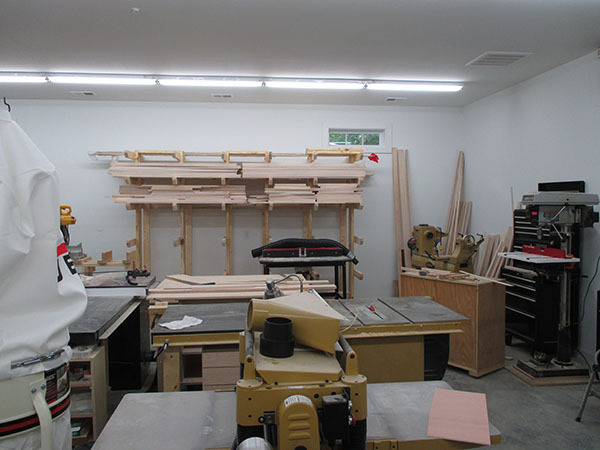 The picture to the left is a view looking towards the southeast corner of the shop after entering the front door next to the electrical service. The service is 230V 1PH 200 AMP and separate from the house service. The worktable in the foreground is 7ft long which is a good practical size. Just beyond is an assembly table that is 36 in wide by 84in long and only 30 in. high. 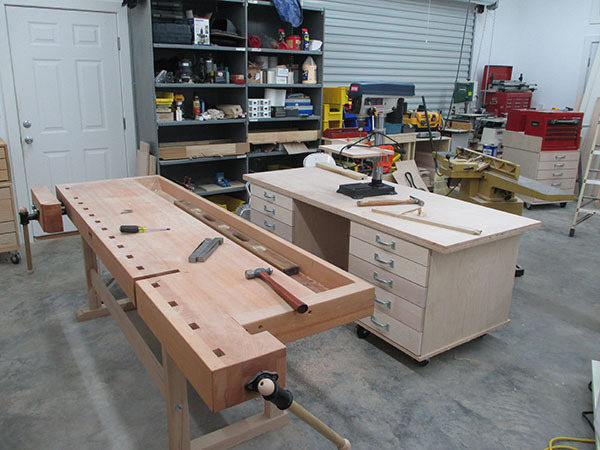 It also doubles as a glue up table when wider panels are required for various projects. Since the table is only 30in. high it can also be used as a desk. I have two table saws in my shop and a large out feed table that also serves as an additional work table. 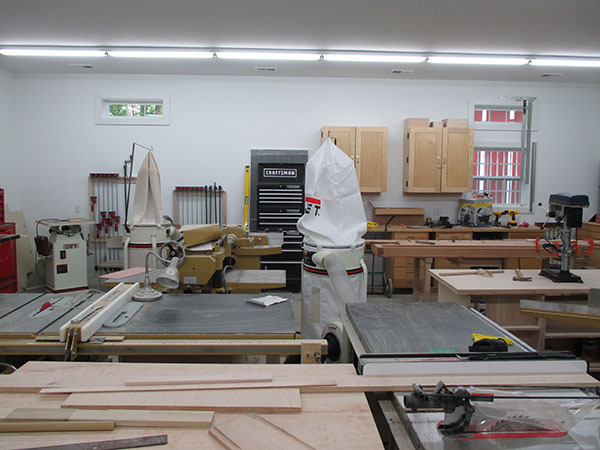 The first table saw is a 3 HP SawStop and the 2nd table saw is a 3 HP Powermatic. The out feed table also has shelves and drawers below the top for the storage of saw blades and accessories for both saws and one of the shelves is sized for my large crosscut sled. These two saws and the out feed table take up a large part of the center part of the floor. The out feed table is on casters so that it can be moved to clean up the saws. Both saws can be seen in the picture to the right and the next picture below. Under the SawStop there is a tool cabinet on casters with five drawers. In the picture (left) you can see the northeast corner where the front door and electrical service is. 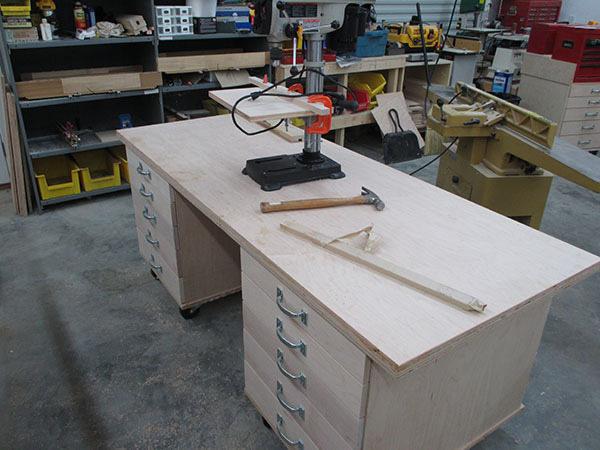 The outfeed table for the Sawstop saw is seen in the foreground. The table has storage for saw blades and my large crosscut sled. The Powermatic table saw is at right angle to the SawStop. I use the SawStop for ripping and the Powermatic for crosscutting and all sorts of sled and jig work. All of the drawer slides are extra heavy duty so that an ample number of saw blades and other accessories will not overload the drawers. Just beyond the Powermatic saw is a Jet portable dust collector. This collector stays at this location at least 90% of the time and it is hooked up to the table saws most of the time. The picture to the right is facing towards the northeast corner. You can see the main red mechanics tool box in the far corner and the only wide door in the shop. It is 9 ft. tall and 8 ft. wide. It rolls up instead of riding up on guide rails and saves overhead space. Above the left side of the large door is a drop down ladder that provides access to an attic storage space above. Near the lumber rack can be seen a large router table on rollers and in the foreground you can see the 20 in Powermatic planer in the foreground and another mobile tool cart underneath the Powermatic table saw. In the picture to the left is a view of the western wall. 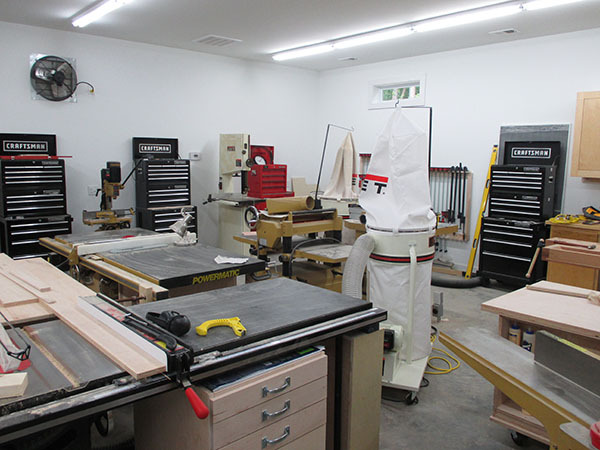 To the left of the clamp racks is a Jet spindle sander and in between the two clamp racks is a Powermatic belt/disc sander. To the left of the window there are two maple hanging tool cabinets. 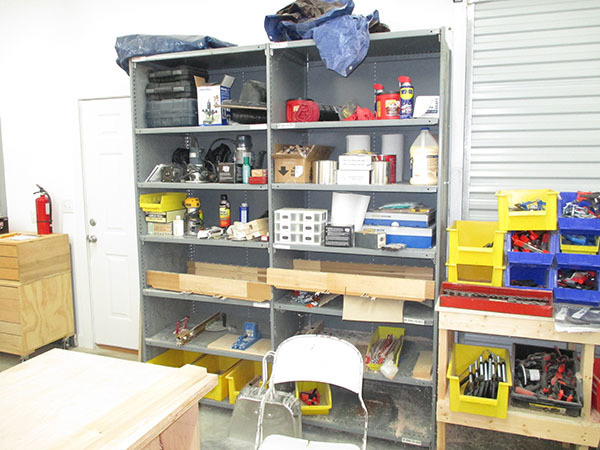 In the center is a craftsman 3 piece tool cabinet with drawers for miscellaneous tools and tooling. I have four of these cabinets which are very efficient storage units. In the picture to the right is the eastern wall where a large combination plywood and lumber rack is seen near the middle of the wall. This lumber rack is very heavy and can store a large amount of lumber and also about ten full sheets of 4ft x 8 ft plywood. In the far right hand corner is a large Powermatic variable speed lathe. 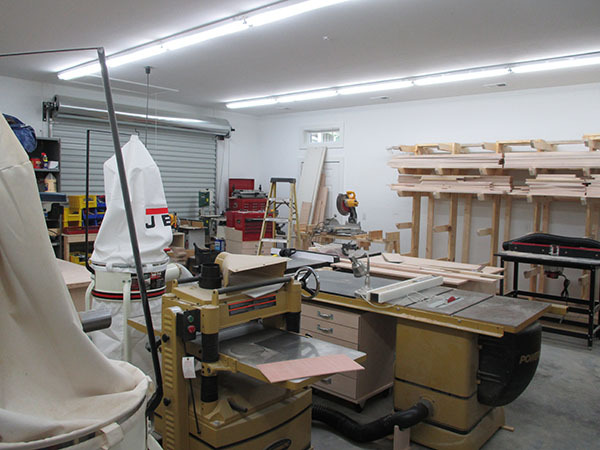 To the left of the lumber rack is a miter saw crosscutting station. In the picture below is a view of the southern wall. 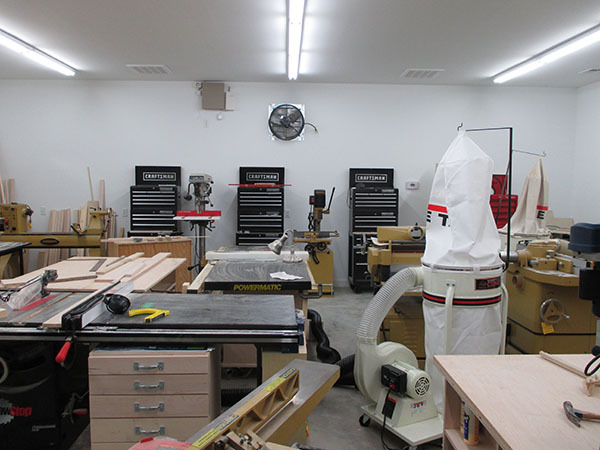 Along the southern wall can be seen the Powermatic lathe to the left, the Delta drill press to the right of the first cabinet, and the Powermatic mortising machine to the right of the 2nd cabinet. A Jet band saw is just to the right of the 3rd cabinet hidden behind the dust collector. In the center toward the top is the ventilation fan. From these various pictures you should be able to mentally construct a picture of how the overall shop is laid out. I’ll try to put up a drawing of the layout soon. In the picture to the right you can see the large rollup door on the right and the front walk in door to the left and between these doors there is a large pair of heavy industrial shelving units. Each shelving unit is 2ft deep x 3ft wide x 7-1/2ft tall and each shelf will support a large amount of weight. These shelves are one of the most important storage units in the shop. When the shop was being built I was very careful to make sure that the space between the two doors was large enough for these shelves. In the view to the left I am standing in the northwest corner looking along the western wall towards the southeast corner. My back is facing the front door. 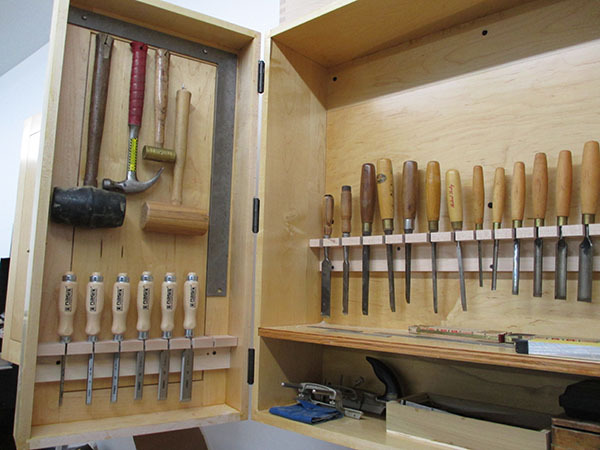 I built the two hanging tool cabinets for my main hand woodworking tools. They are both 36 in. x 36 in. x 13 in. deep. The two doors on each cabinet are about 2-1/2 in. deep in order to hold tools. With all of the tools they hold they are both quite heavy and are hung with French cleats top and bottom. The cleats are mounted to the studs in the wall with larges heavy duty screws that are designed for such a load. In addition there are six other screws which are fastened thru the plywood backs into the studs. They should be over engineered which I have a tendency to do sometimes. 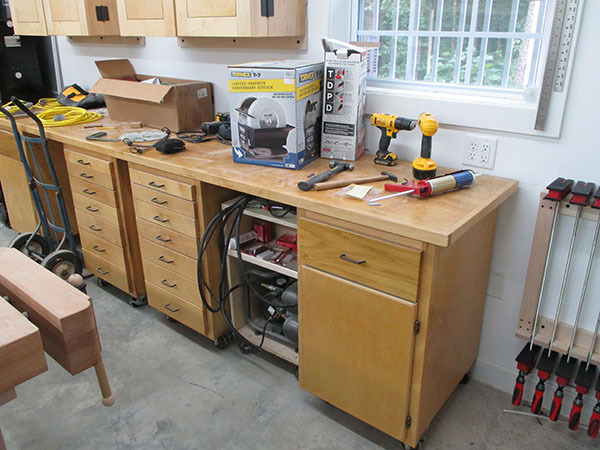 Beyond the cabinet bench is the Powermatic 5 HP shaper and beyond the shaper is the Jet 18 in. band saw. 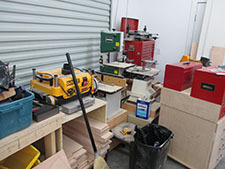 The spindle sander and belt/disc sander can be seen to the right near the corner. 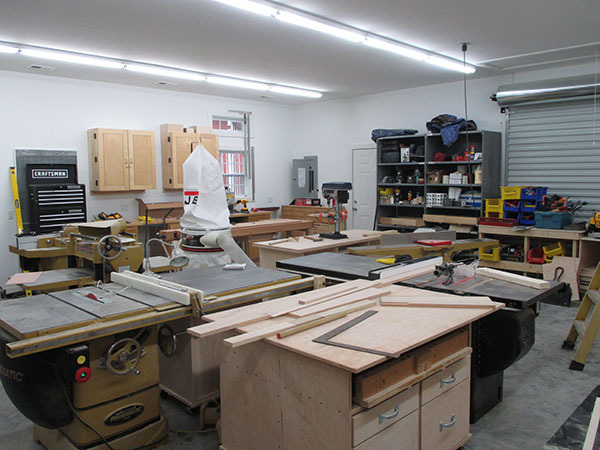 In the picture to the right you can see a drawer storage cabinet that I built years ago for my old shop. If you look closely you can see that it was built in 2 stages at different times. A rack for my 24 in. bar clamps is near the floor and to the left of drawer units. There are four transom windows which you can see near the ceiling in some of the pictures. I have never in my life had enough wall space in a shop. I’m not sure that that window would be there if I had it to do over again. Once again, I wish the shop was 35 ft. x 35 ft. Along the wall in the picture below you can see two work tables with a set of drawers and a door cabinet in each. These are 24 in. wide, 72 in. long and 34 in. tall with 1-1/2 in. laminated plywood tops and heavy edge banding on the tops. Their fronts face the front of my work table. There is 18 in. of space between the tool cabinets and the top of these work tables. They are also on rollers so that I can easily clean up behind the cabinets when necessary. I had both of these in my previous small shop. Most of the work was done on these in my driveway because the old shop was so small. There is a small cart for my air compressor under the middle space of the right worktable. 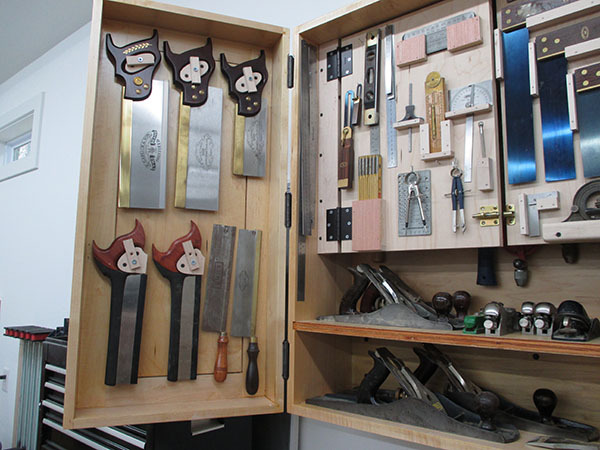 In the black Craftsman tool cabinet (right) just beyond the two worktables I keep all of my carving chisels, gouges, and knives. 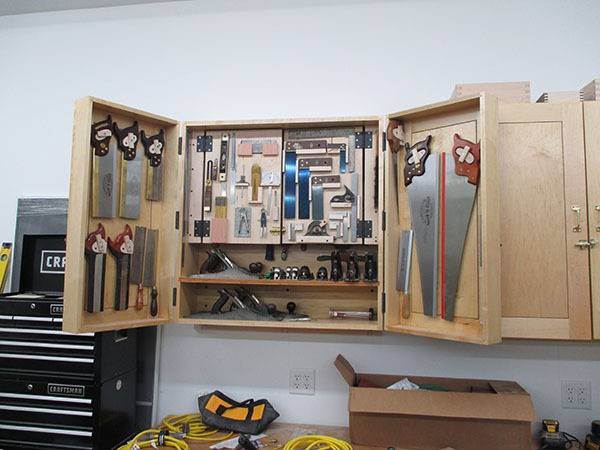 I have four of these cabinets and they are the most efficient way that I’ve thought of to store all sorts of tools and tooling. They are very heavy duty and I paid about 50% off normal price. I could not have come close to building them for what I paid for them. To the right of this window I will mount either a piece of plywood or just use perforated board so that I can hang all sorts of miscellaneous items. The Only Shop Window, Space for Hanging Tools Next to Window. 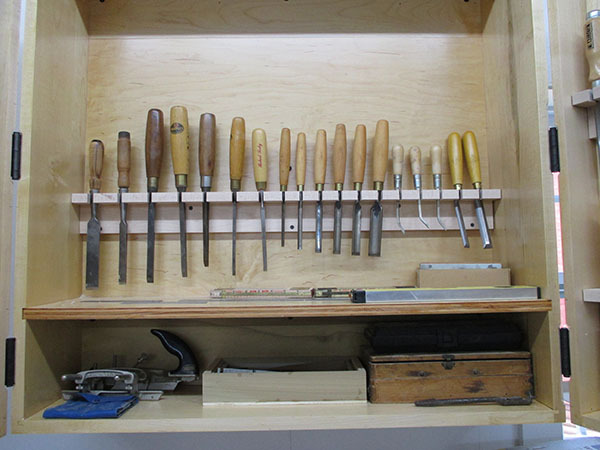 In these two work tables along the wall there are plenty of drawers and a couple of doors with shelves behind them so there are plenty of storage spaces for tools near the cabinet makers bench. 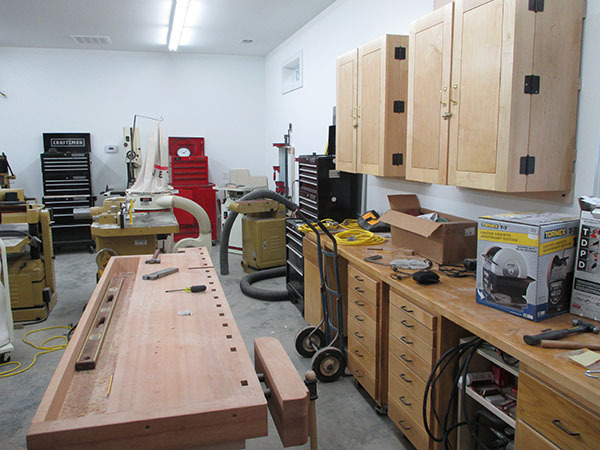 There is ample floor space between the two work tables along both sides of my cabinet makers bench. There is also enough room below the wall cabinets to allow some work to be done on the bench tops below. 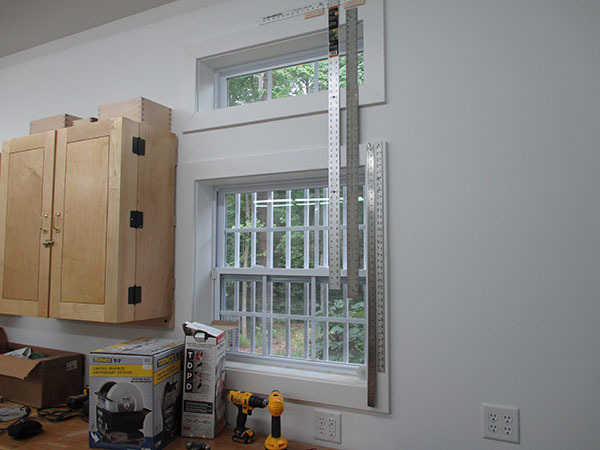 The wall space to the right of the window will be used for hanging tools. 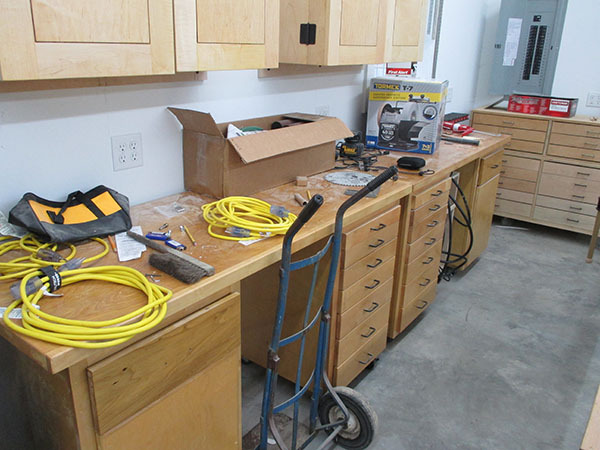 The main electrical panel for the shop is conveniently located near the front door and the drawer storage below is not far from the cabinet makers bench. 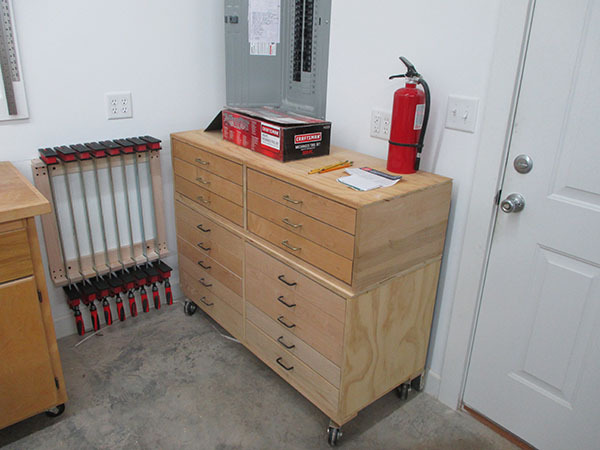 This gives even more tool storage near the main work bench. 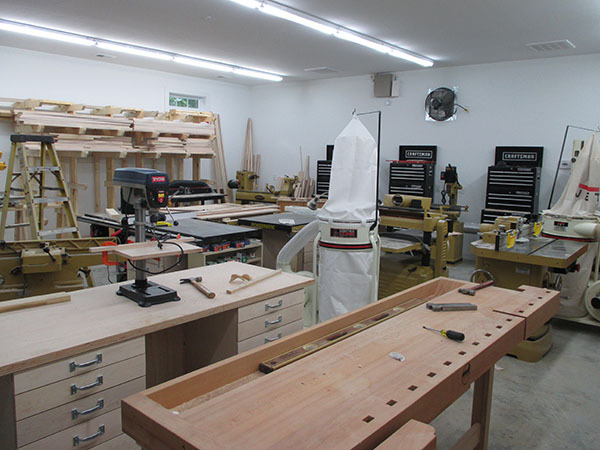 The aisle in the picture to the right is just next to front of the work bench which makes all three work benches close to each other and also close to most of the hand tools. Just behind my workbench and parallel to it is my assembly table. The top is 34 in. x 74 in. and there is plenty of drawer storage in the two pedestals; there are shelves in the back of the table. I plan on making another top for this that will extend the table top to 38 in. x 80 in. so that I could conveniently glue up a good size wall unit section if need be. The large top would be removable. The assembly table is also on heavy duty rollers so that it can be moved if necessary. I can easily move the small drill press when it is necessary. There are 10 drawers below the top and open shelving on the back side. Being only 30 inches high the assembly table also doubles as a pedestal desk. When I need to do some design work or calculations and planning. I plan on storing mostly jigs and fixtures in these heavy metal shelves in the picture to the left. These are 24 in. x 36 in. x 84 in. tall. Next to the shelves are some small clamps in bin boxes. All of the small machines in front of the rollup door are on rollers except for the scroll saw. Bringing lumber in is not much trouble. I usually don’t have to move but a couple of machines when I use the rollup door. Hey, if I had it to do over again I would have built the shop 35 ft x 35 ft. 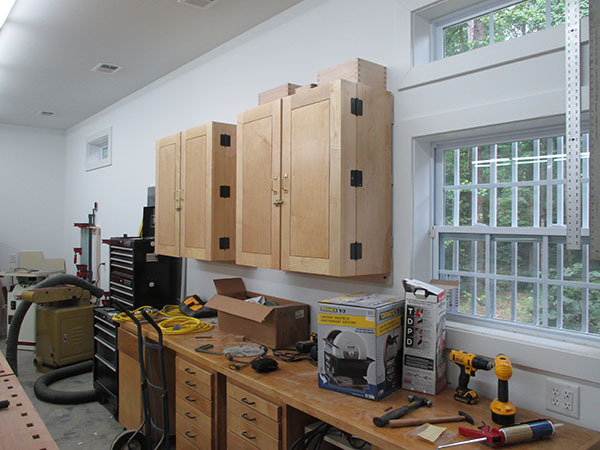 The hanging tool box (above) is 36 in x 36 in x 13 in deep It is made out of solid maple hardwood and plywood panels. 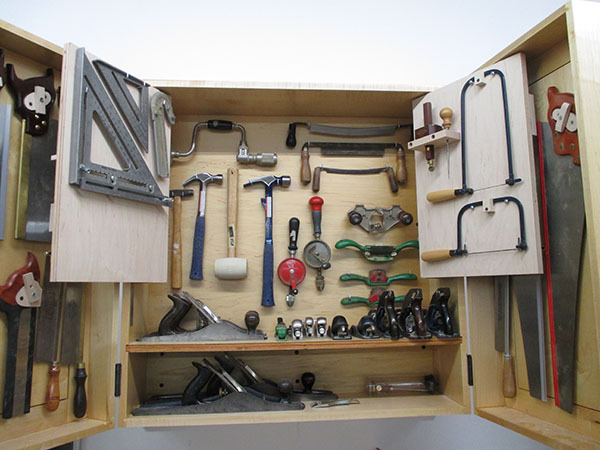 It holds a variety of tools and is near the main workbench and the are 2 more workbenchs below. The next three pictures below show several more views of the tools. The three pictures above and below show several views of the right hanging tool cabinet. 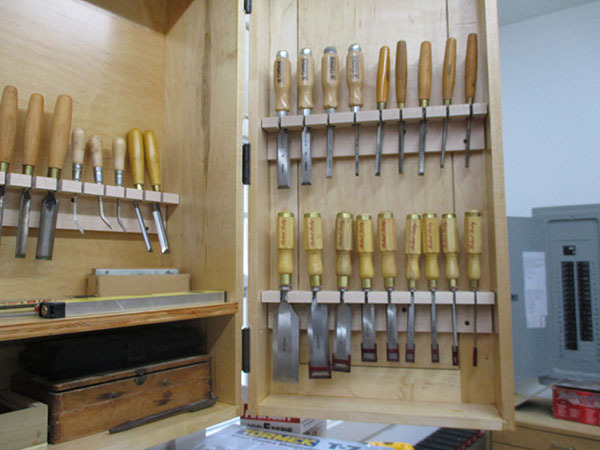 This cabinet contains mostly chisels. 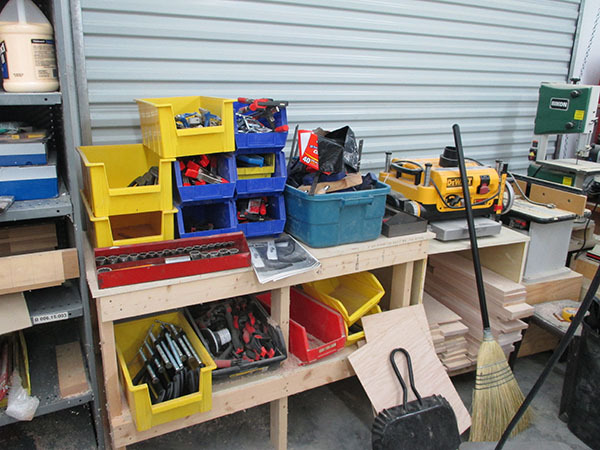 There is a utility table with bin boxes that contain various small clamps and also a cart that contains a 12 inch Dewalt planer. To the right of the planer there is a small router table, a small Jet spindle sander, a small Jet lathe, a small band saw, and a couple of carts with mechanics and maintenance tools. These are all on carts and when I use the large door to bring in lumber I usually don’t have to move but two carts. 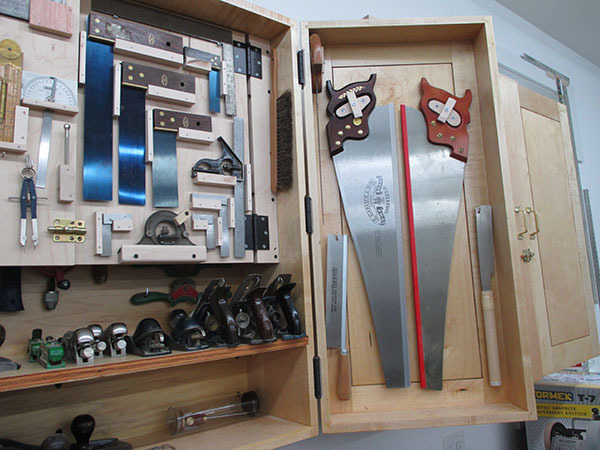 I stumbled upon your site when i checked your tool cabinet in the lumberjocks forum. 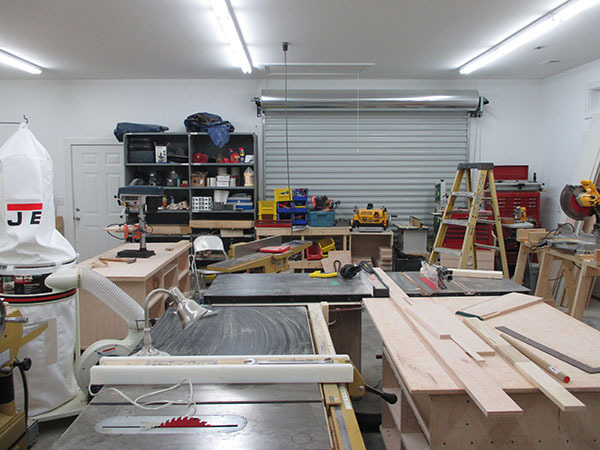 I am also building a shop and started putting in tools when i had to stop for a major abdominal operation 3 months ago. I am recovering fast but still i cant go back to my shop just as yet. I may have to wait for another 3 months i was told. I have two saws. My old one is a grizzly 12 incher and a new purchase before i was operated is a PM2000 which is still in crates. Id love to know why you demoted the sawstop for ripping only and the powermatic to a more precise cutting jobs? I totally love your shop and will get inspiration on how to build mine. I still have a lot to learn in this craft. Godbless. You got a nice shop, im kinda jealous lol.